VietNamNet Bridge – On September 11, American doctor McKinnon and doctors, medical staff of the FV Hospital in HCM City, successfully performed surgery to remove giant tumors from the feet of a 20-year-old girl from Hue City. Right from birth, parents saw abnormal signs on the feet of Tran Thi My Son, in Huong Thuy district, Hue City. The feet began to swell so much that she could not walk. 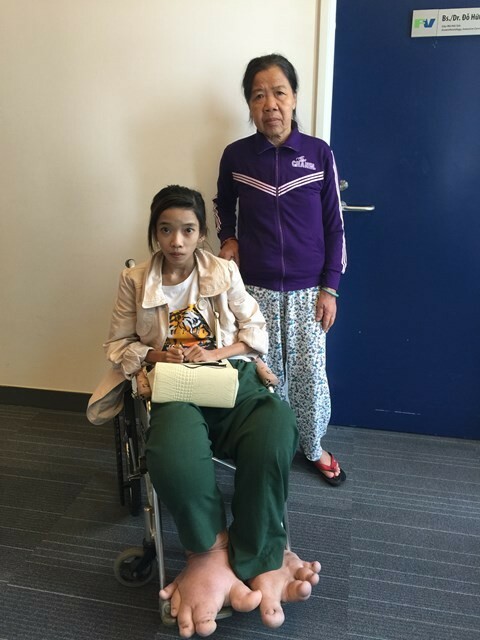 Mrs. Pham Thi Dua, 60, carried her daughter on her back to many hospitals but doctors could not cure the odd disease. When Son was 10 years old, she had to quit school because of feelings of inferiority and the pain on her feet. Her mother was unable to carry her, so Son had to move her by dragging her legs. On September 10, Dr. McKinnon examined the patient and decided to conduct surgery the next day. He removed the bottom of the bundles of nerve fibers, which was the major cause of the tumors on Son’s feet. Doctors said the tumors would no longer grow or would grow slowly. As Son was very weak, Dr. McKinnon cut only part of the tumor. Next year he will return to Vietnam to cut the remaining tumors and perform foot orthopedics for the girl. In 2012, Dr. McKinnon worked with FV Hospital to successfully remove a 90kg tumor for Mr. Nguyen Duy Hai, 35, in Da Lat City, in Lam Dong province. Dr. McKinnon is working at the Saint Joseph Hospital in Chicago, Illinois, in the US and the Children's Memorial Hospital under the Medical University of Chicago. He has traveled around the world with humanitarian organizations to give free treatment for unusual cases, especially patients with giant tumors. During his return to Vietnam this time, Dr. McKinnon and the surgical team of FV Hospital also conducted face renewal operations for three patients: Nguyen Hoang Thien An (18, Vung Tau City), Kieu Thi My Dung (22, Da Lat), and Nguyen Thi Ngoc Thi (26). All of them had severe facial tumors.